Dealing With Employee Issues  If I ignore it, will it go away?  That didn’t work, now what? 1 Dealing With Employee Issues  If I ignore it, will it go away?  That didn’t work, now what? 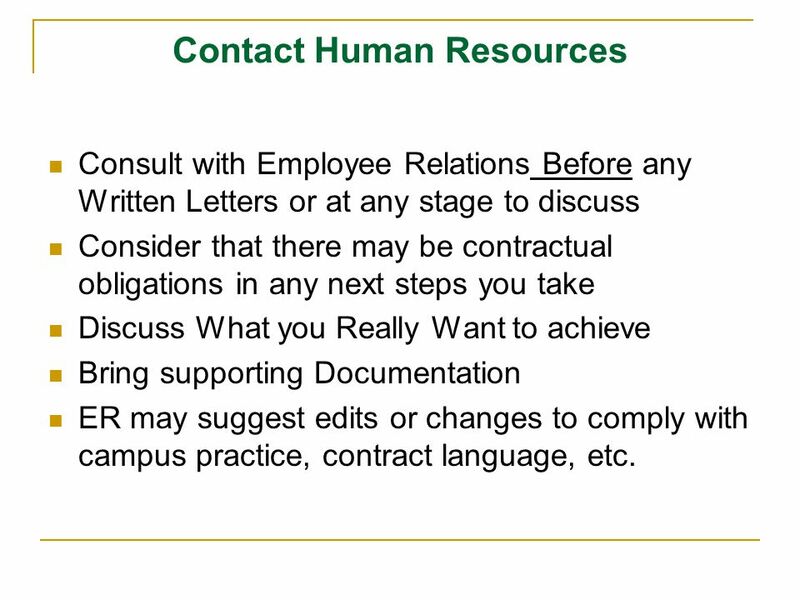 9 Contact Human Resources Consult with Employee Relations Before any Written Letters or at any stage to discuss Consider that there may be contractual obligations in any next steps you take Discuss What you Really Want to achieve Bring supporting Documentation ER may suggest edits or changes to comply with campus practice, contract language, etc. 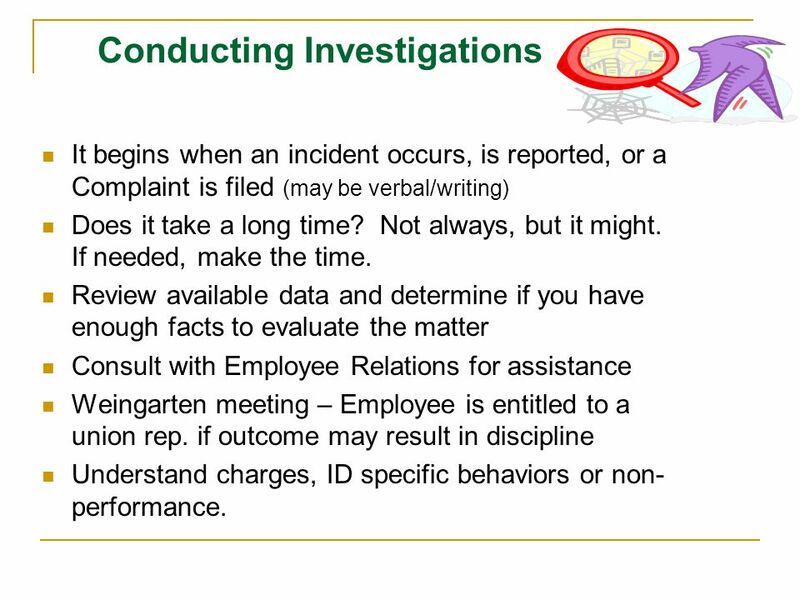 11 Conducting Investigations It begins when an incident occurs, is reported, or a Complaint is filed (may be verbal/writing) Does it take a long time? Not always, but it might. If needed, make the time. 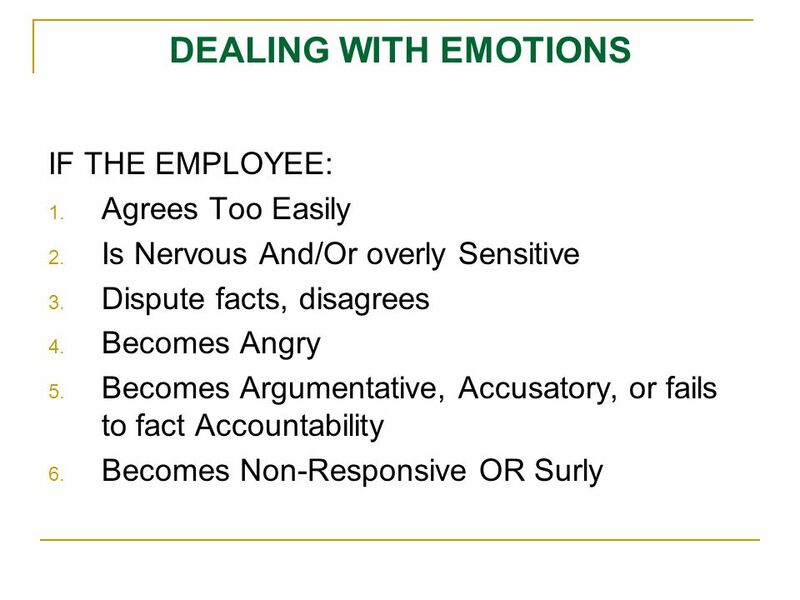 Review available data and determine if you have enough facts to evaluate the matter Consult with Employee Relations for assistance Weingarten meeting – Employee is entitled to a union rep. if outcome may result in discipline Understand charges, ID specific behaviors or non- performance. 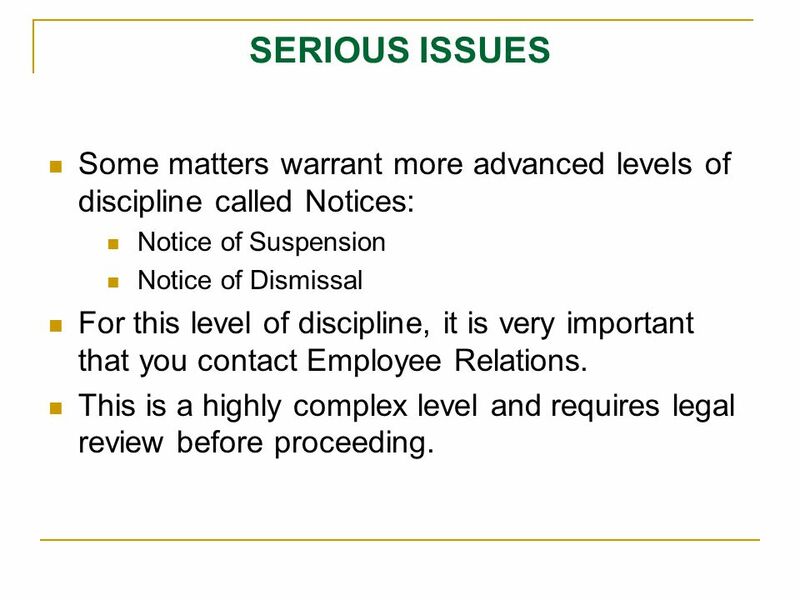 12 SERIOUS ISSUES Some matters warrant more advanced levels of discipline called Notices: Notice of Suspension Notice of Dismissal For this level of discipline, it is very important that you contact Employee Relations. This is a highly complex level and requires legal review before proceeding. 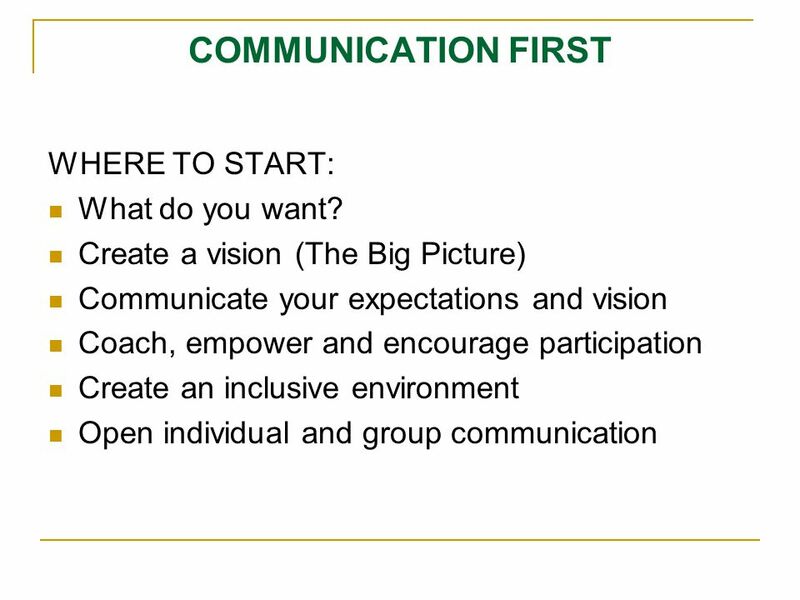 13 TALKING WITH THE EMPLOYEE Set the tone of the discussion:  Verbal Warning  Consider employee’s comments  Inform the employee that the must improve  Obtain the Employee commitment to improve. 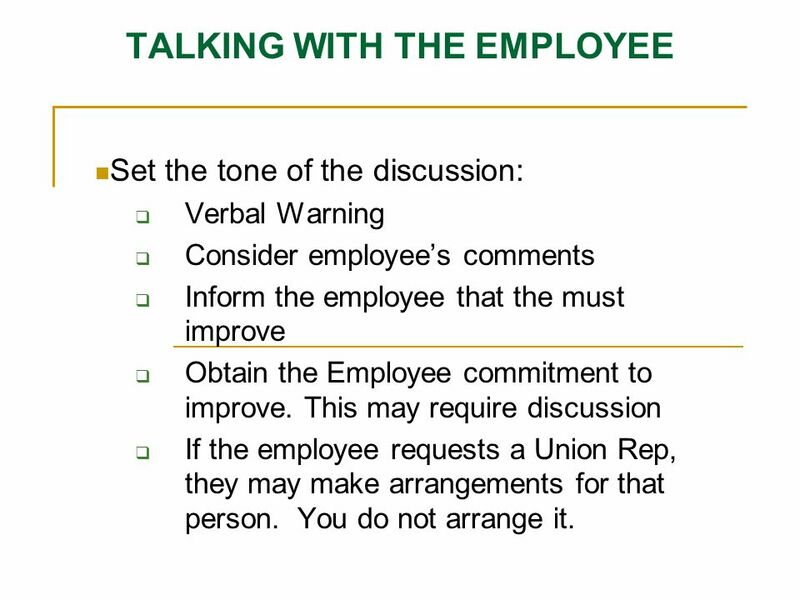 This may require discussion  If the employee requests a Union Rep, they may make arrangements for that person. You do not arrange it. 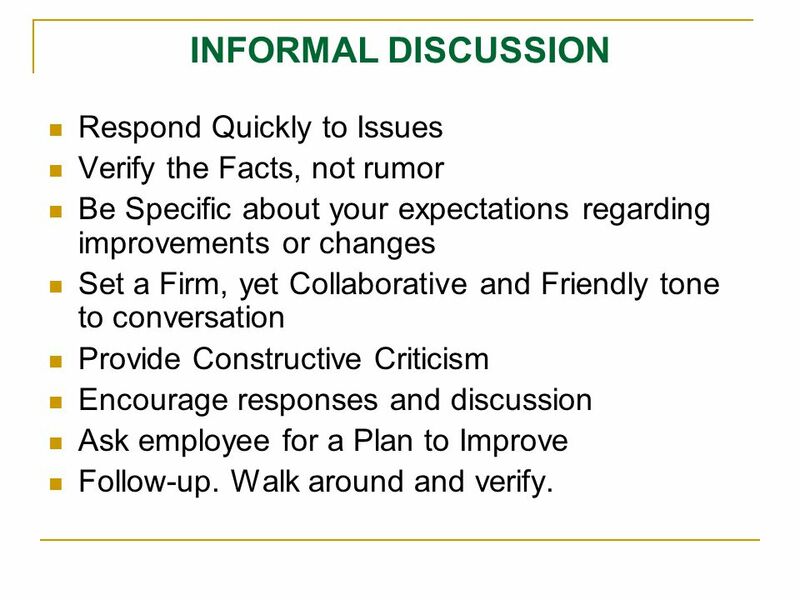 14 INFORMAL DISCUSSION Respond Quickly to Issues Verify the Facts, not rumor Be Specific about your expectations regarding improvements or changes Set a Firm, yet Collaborative and Friendly tone to conversation Provide Constructive Criticism Encourage responses and discussion Ask employee for a Plan to Improve Follow-up. Walk around and verify. 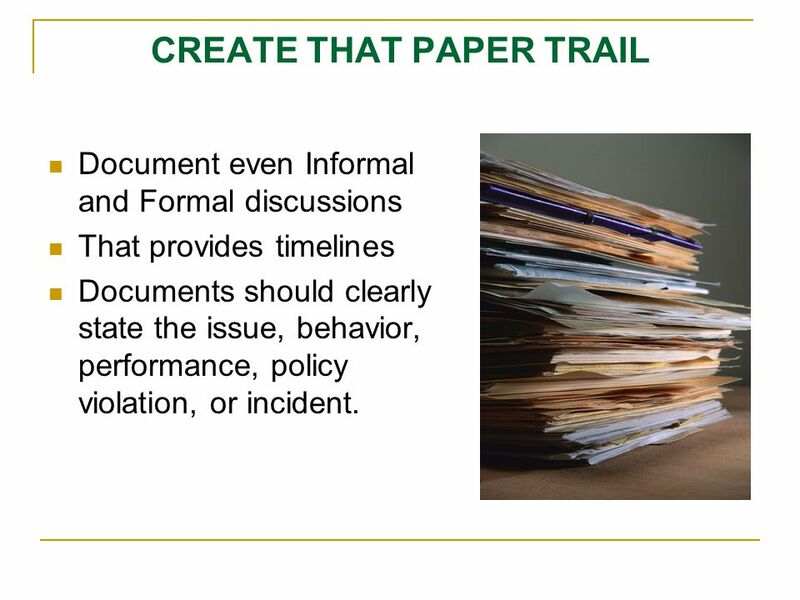 16 CREATE THAT PAPER TRAIL Document even Informal and Formal discussions That provides timelines Documents should clearly state the issue, behavior, performance, policy violation, or incident. 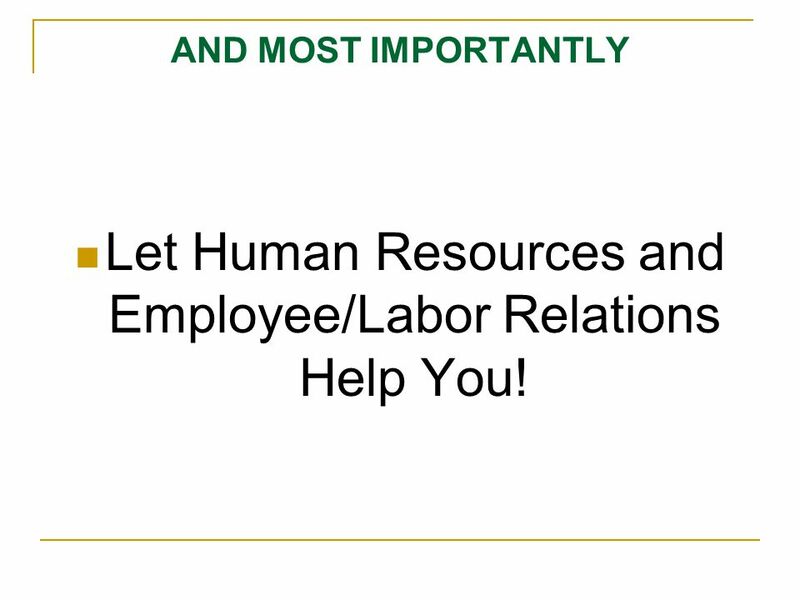 17 AND MOST IMPORTANTLY Let Human Resources and Employee/Labor Relations Help You! 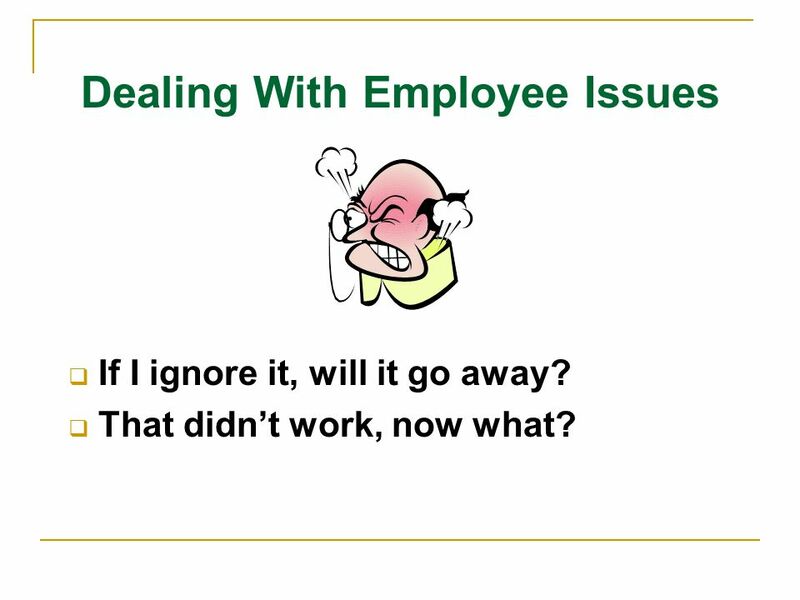 Download ppt "Dealing With Employee Issues  If I ignore it, will it go away?  That didn’t work, now what?" 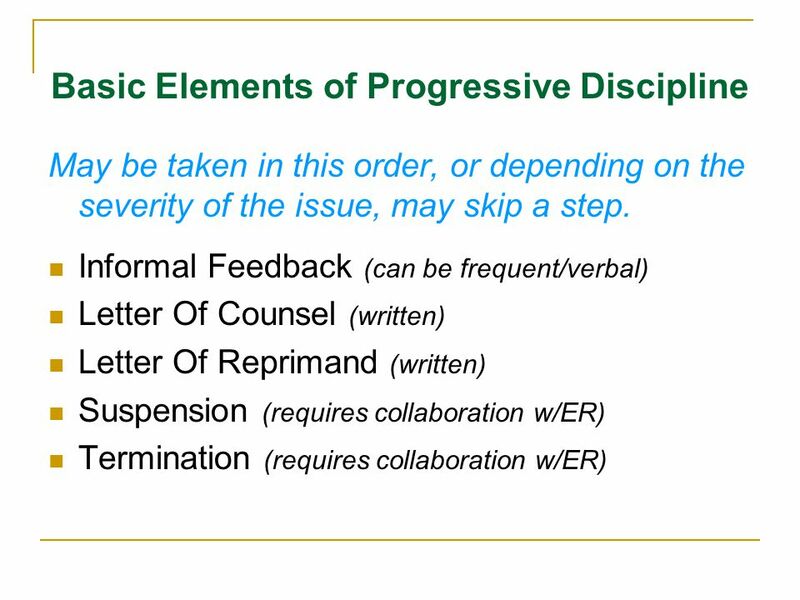 Department of Employee Relations June Unsatisfactory performance and/or behavior of non-instructional staff can be addressed through progressive. EFFECTIVE DOCUMENTATION In Search of Improved Performance. 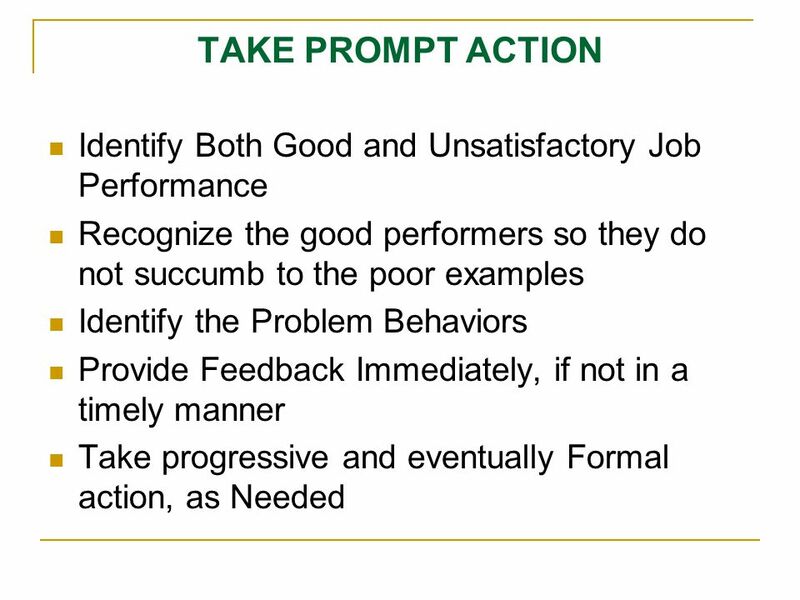 Employee Performance Any employee’s performance can change in a variety of ways during her/his tenure in a position. Ideally, everyone would follow the. 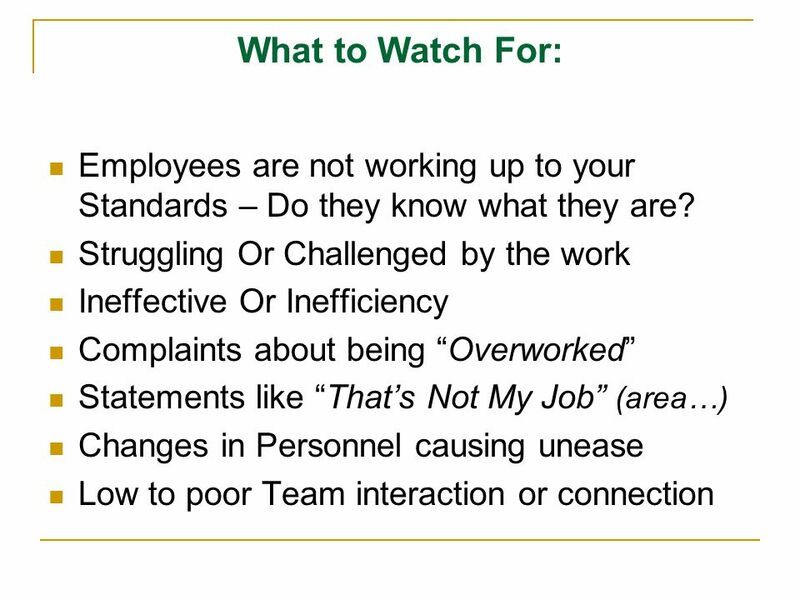 Performance Management Guide for Supervisors. 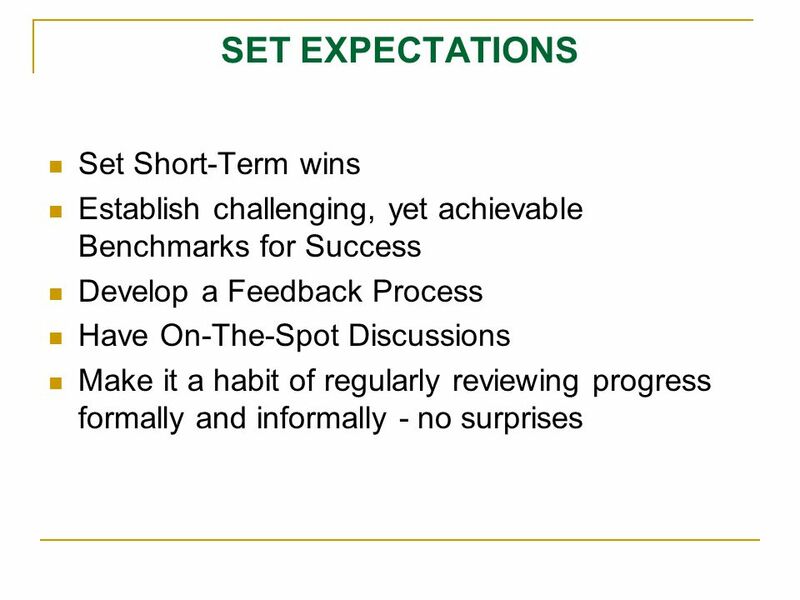 Objectives  Understand necessity of reviews;  To define a rating standard across the Foundation for an. 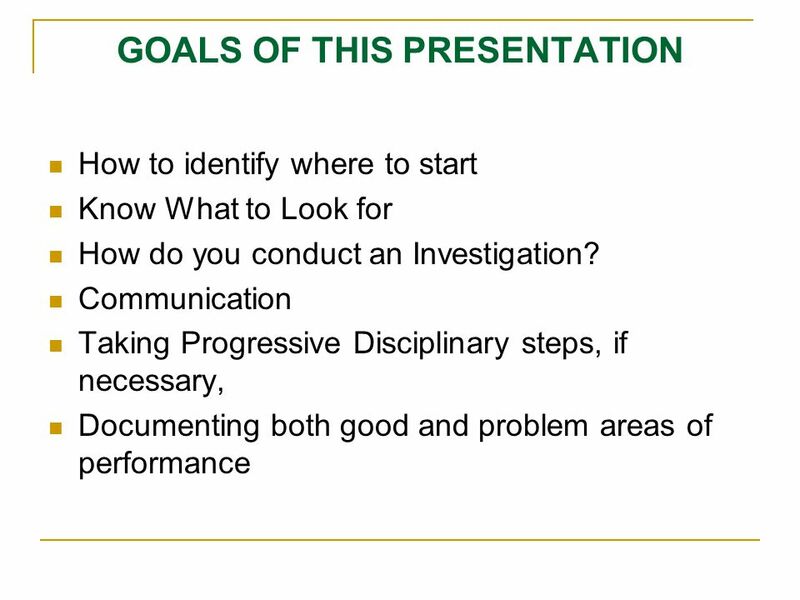 Investigation Best Practices. 10.If serious allegations are made against an employee use suspension with pay to allow time to investigate. 9.Meet with. Finding Your Inner Leader Take me to your Leader Leader. 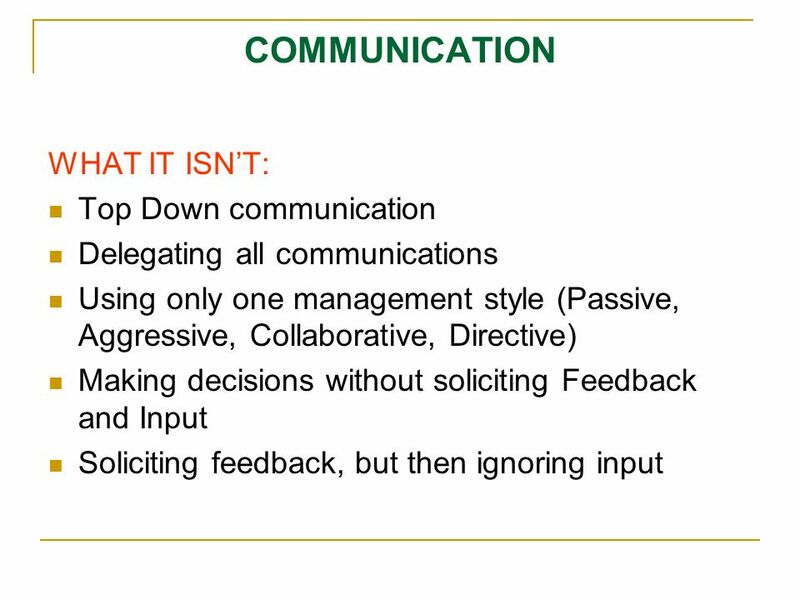 Managing Employee Issues Taking Action Employee Relations. The Use of Counseling and Discipline to Improve Employee Productivity. Fire and Emergency Services Company Officer — Lesson 3 Fire and Emergency Services Company Officer, 4 th Edition Chapter 3 — Supervision.